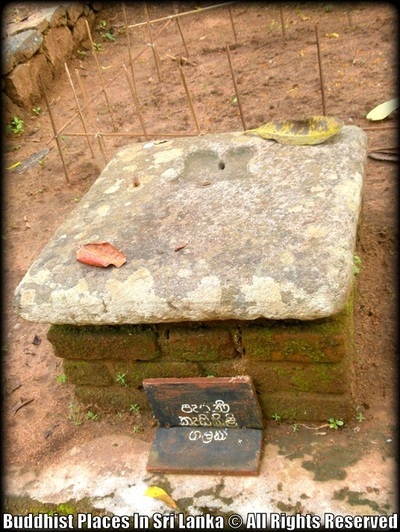 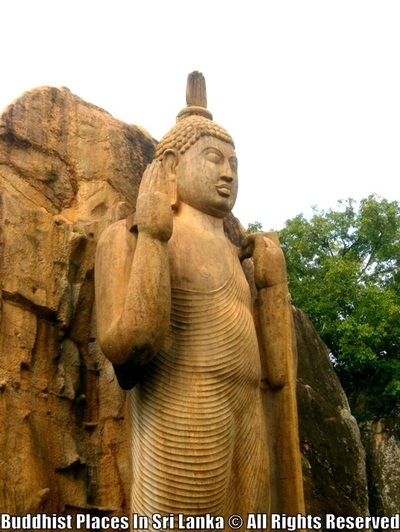 ​The Avukana statue is located in the village of Avukana (also spelled Aukana) near Kekirawa in the North Central Province of Sri Lanka. 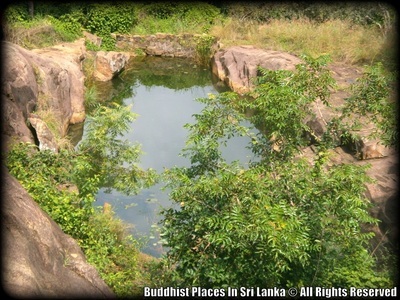 It is close to the Kala Wewa reservoir, and is positioned facing it. 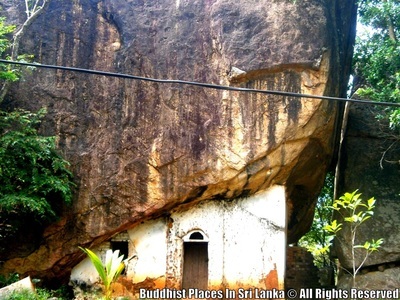 It has been carved out of a large granite rock face, but is not completely separated. A narrow strip of rock has been left at the back of the statue, connecting it to the rock face and supporting it. 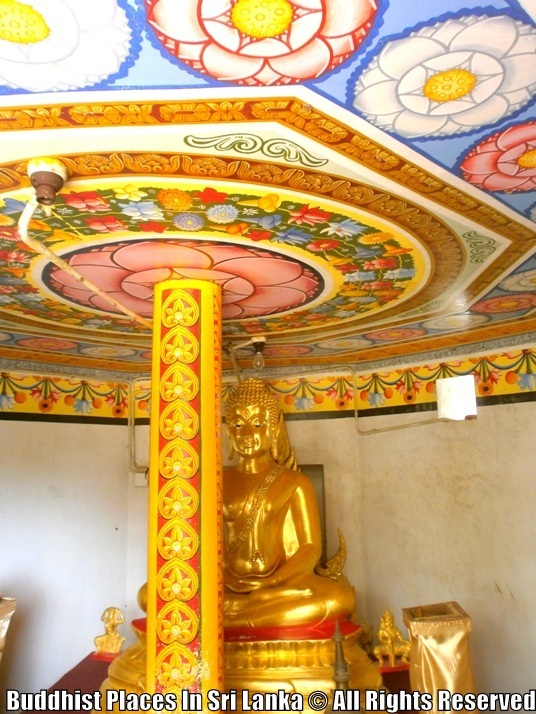 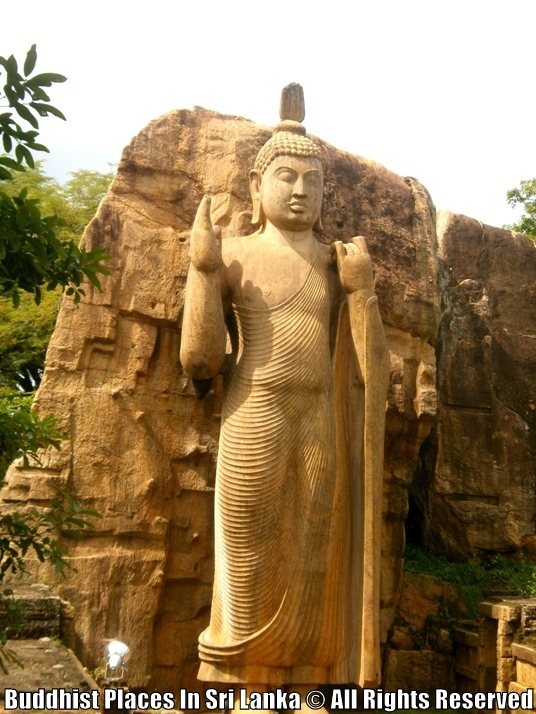 However, the pedestal on which the Buddha stands, which is carved in the form of a lotus flower, has been carved separately and positioned under the statue. 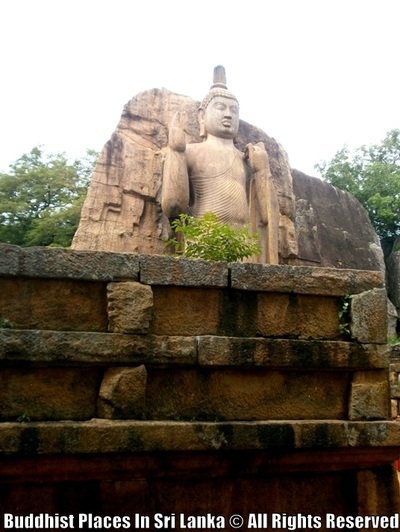 The statue alone is 38 feet 10 inches (11.84 m) in height, and with the pedestal the total height of the Avukana statue reaches 42 feet (13 m). 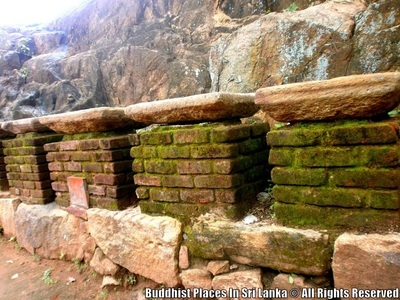 The statue had been located within a large image house or shrine, of which parts of the walls still remain. 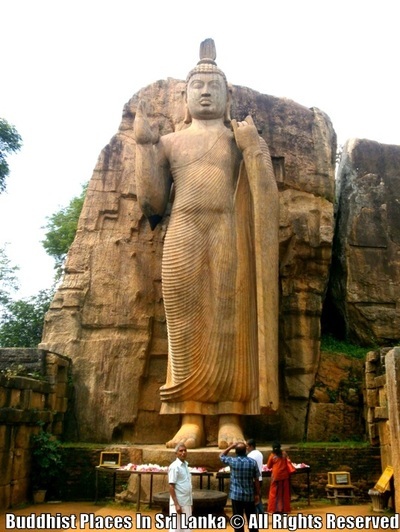 It had been made of brick and stone, and was 74 feet (23 m) long and 63 feet (19 m) wide. 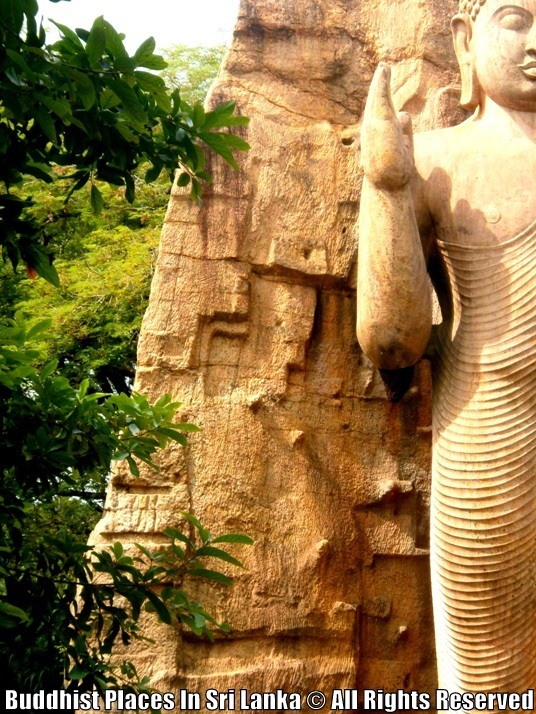 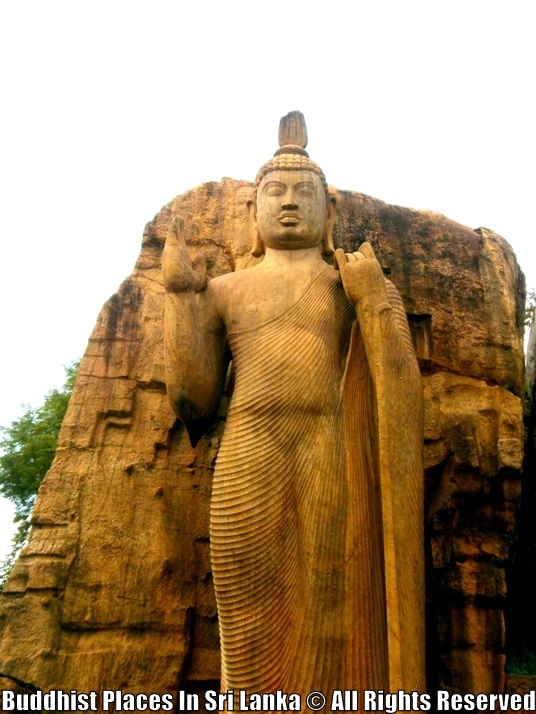 The Avukana statue is considered to be one of the best examples of a standing statue of the Buddha from ancient Sri Lanka. 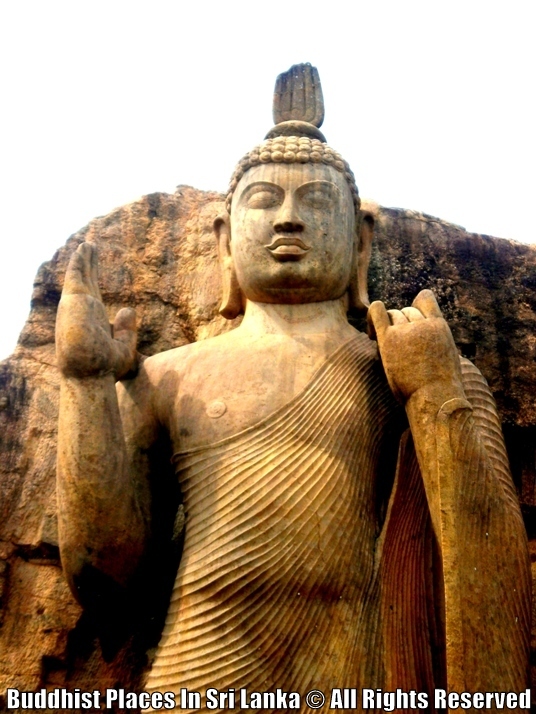 The Avukana statue indicates some influence of the Gandhara school of art, as well as the Amaravati school of art of India. 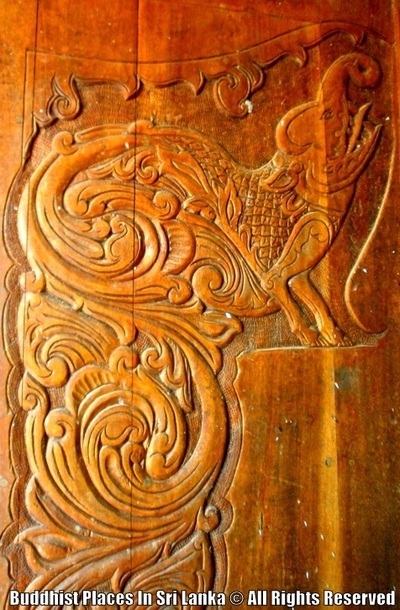 The robe is worn tightly, clearly outlining the shape of the body, and its pleats are carved clearly and delicately. 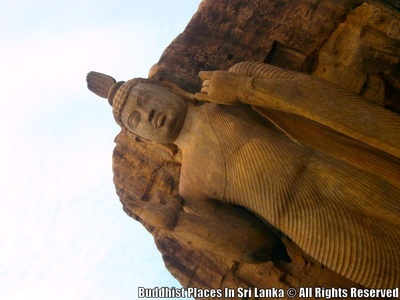 It's worn over the left shoulder, and the right shoulder is bare, as is the tradition in Buddha statues of Sri Lanka. 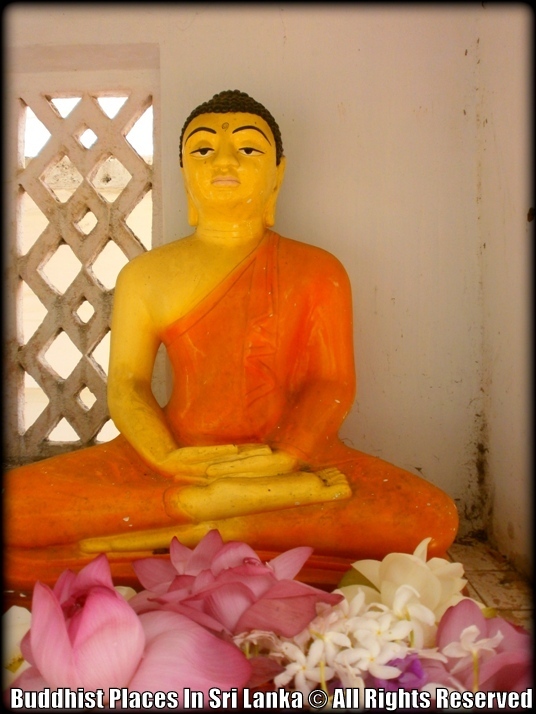 The Buddha's body is straight, and the left hand clutches the robe at the left shoulder. 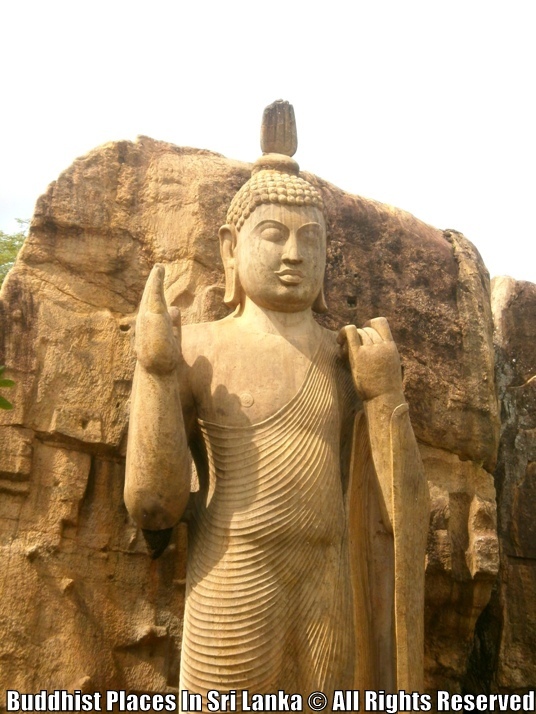 The right hand is raised up to the right shoulder, with the palm facing left. 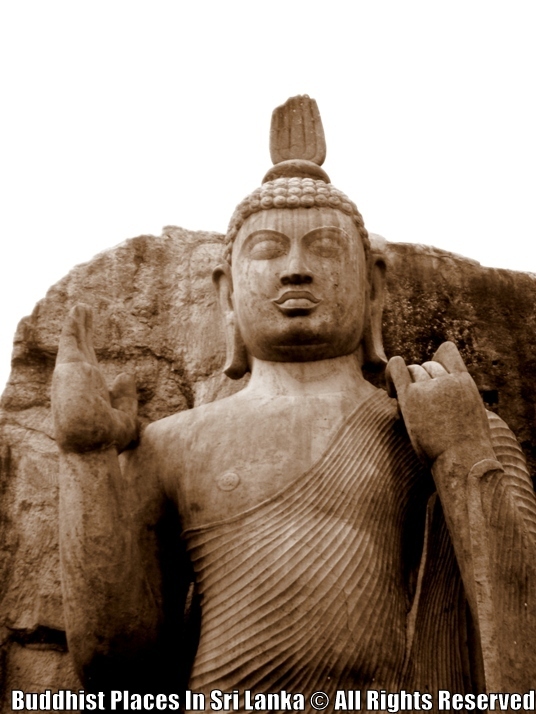 This position is known as the Asisa mudra, a variation of the Abhaya mudra. 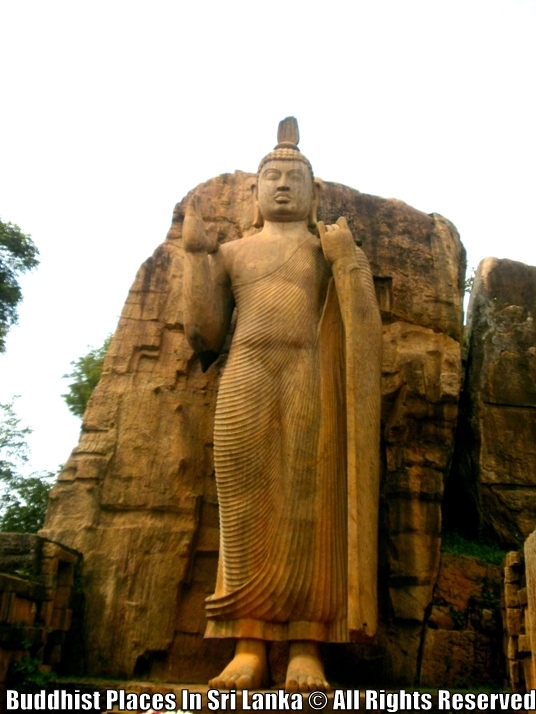 The Avukana statue is widely believed to have been constructed in the 5th century during the reign of King Dhatusena, and under his orders. 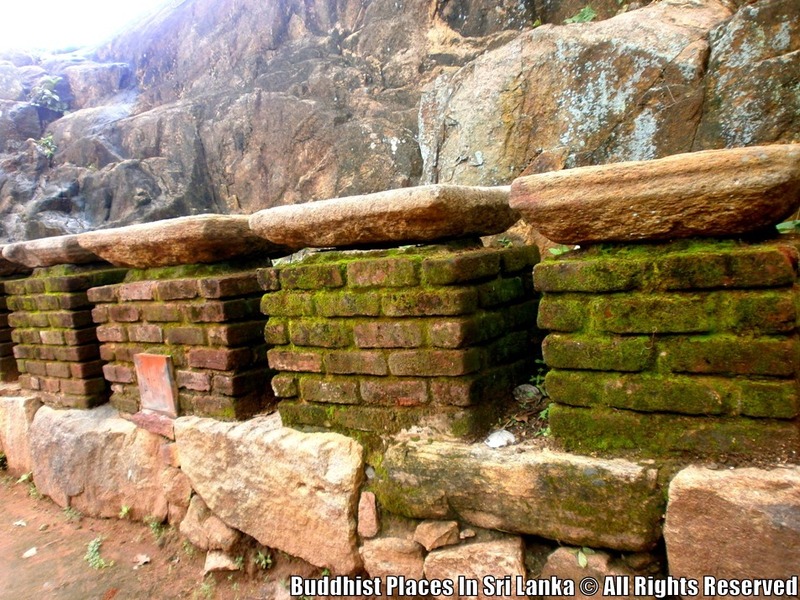 However, another theory is that it was done by an individual named Barana. 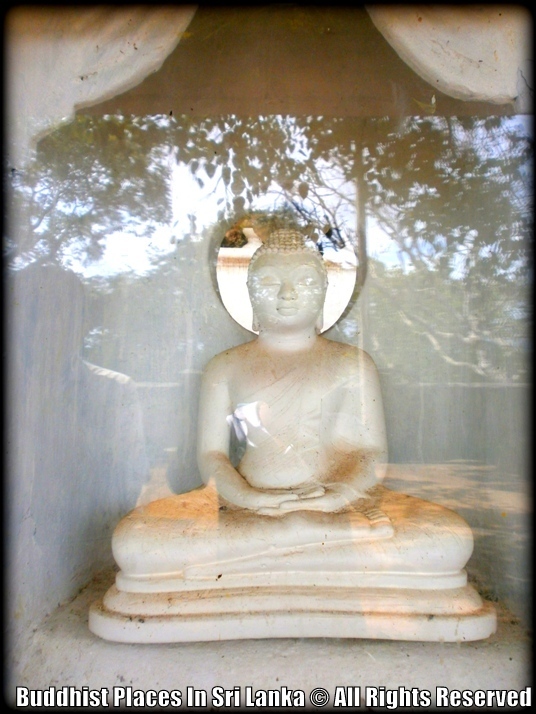 There is another standing statue of the Buddha, quite similar to the Avukana statue, at Sasseruwa located close to Avukana. 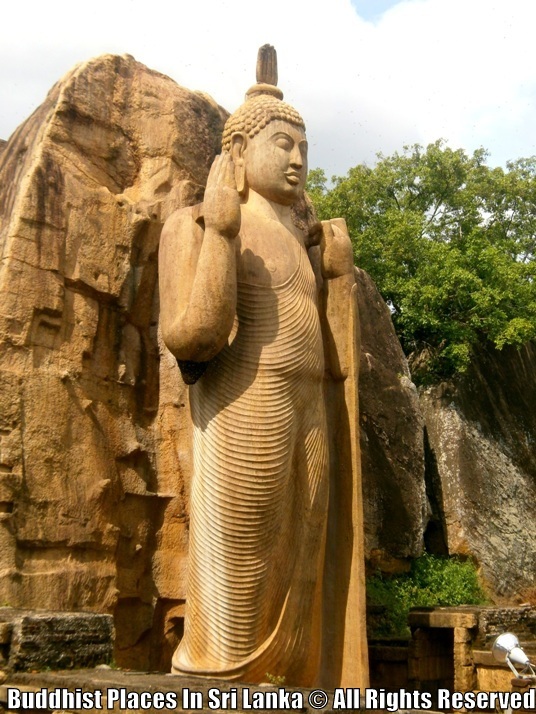 According to legend, the two statues are the result of a competition between a stone sculpting guru (master) and gola (pupil). 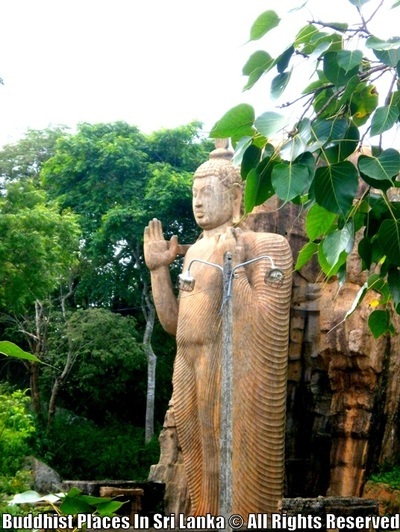 The story goes that the master constructed the Avukana statue, while the pupil made the statue at Sasseruwa. The first to complete his statue had to notify it to the other by ringing a bell. 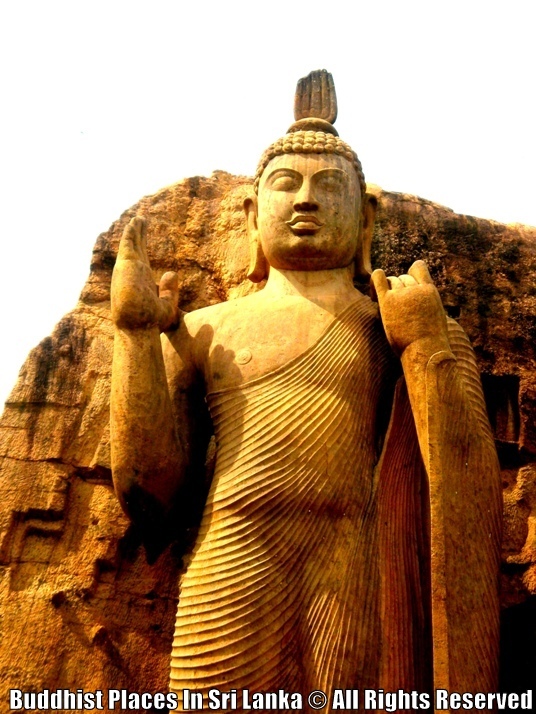 The master managed to complete his statue first, and won the competition. This is said to be the reason that the Sasseruwa statue is in an unfinished state. 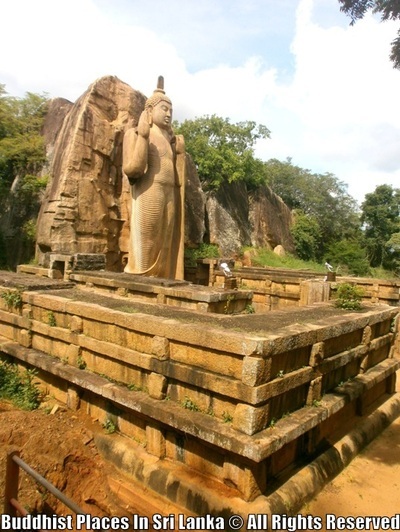 The Avukana statue is considered to be the better of the two, and similarities between them have led historians to believe that the story is actually true. 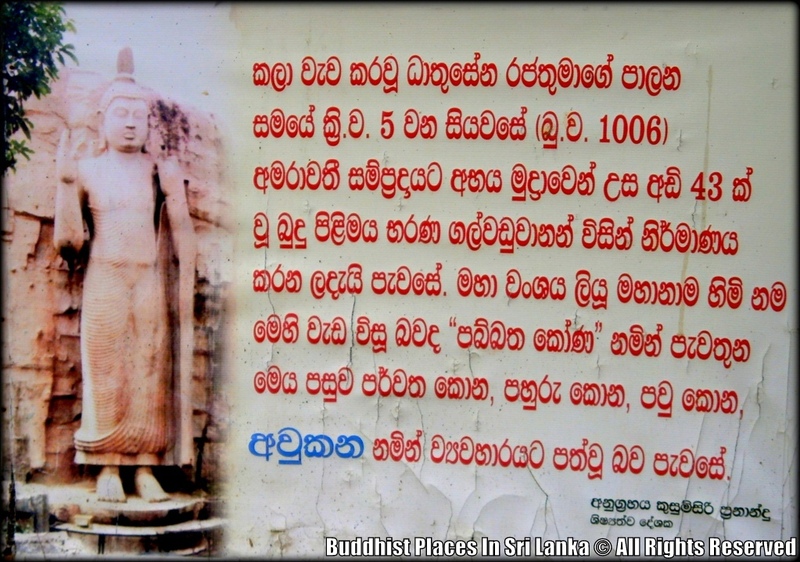 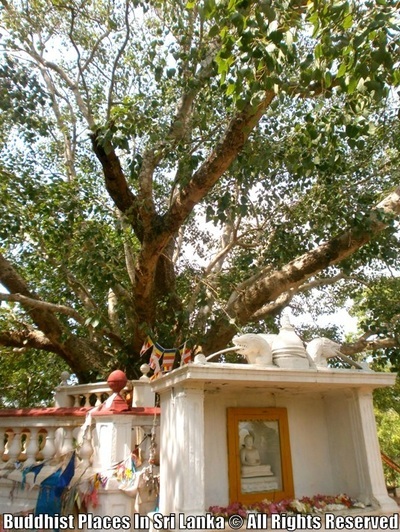 But in fact that is mere legend as the fact is that Sasseruwa also known as Reswehera was built nearly four hundred years prior to Avukana Buddha image. 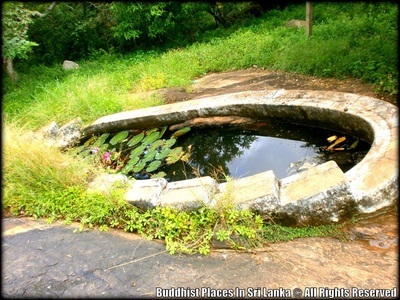 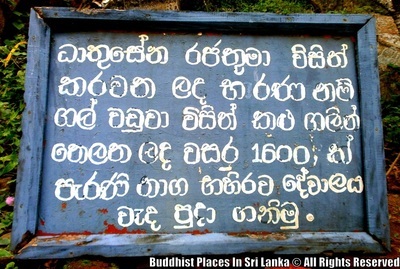 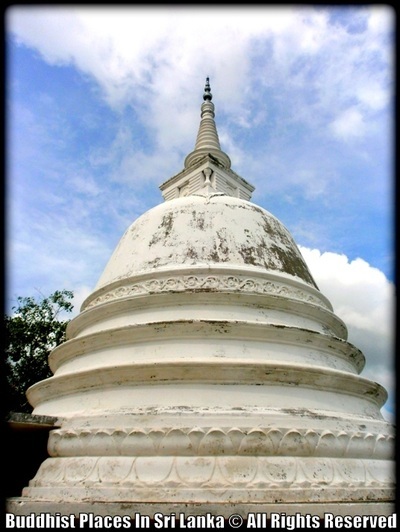 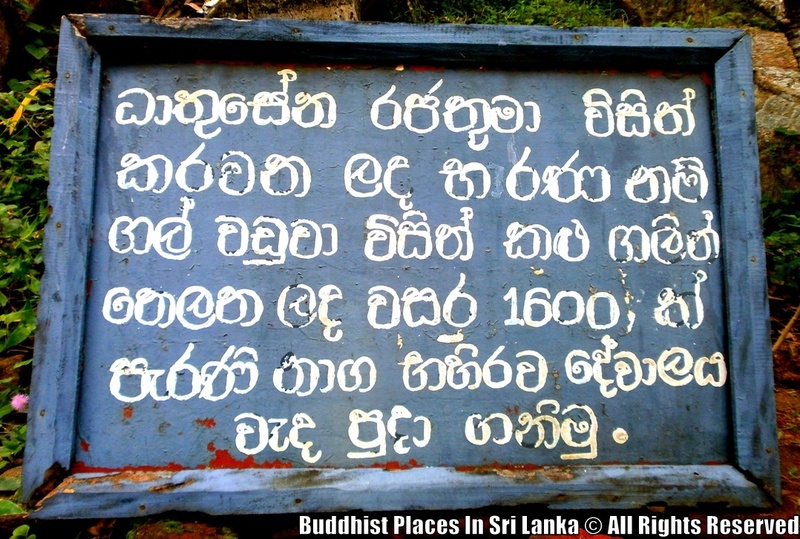 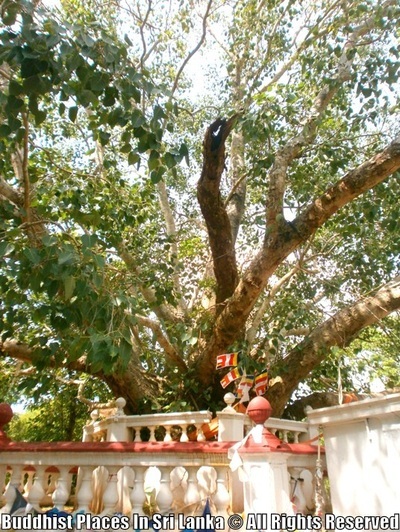 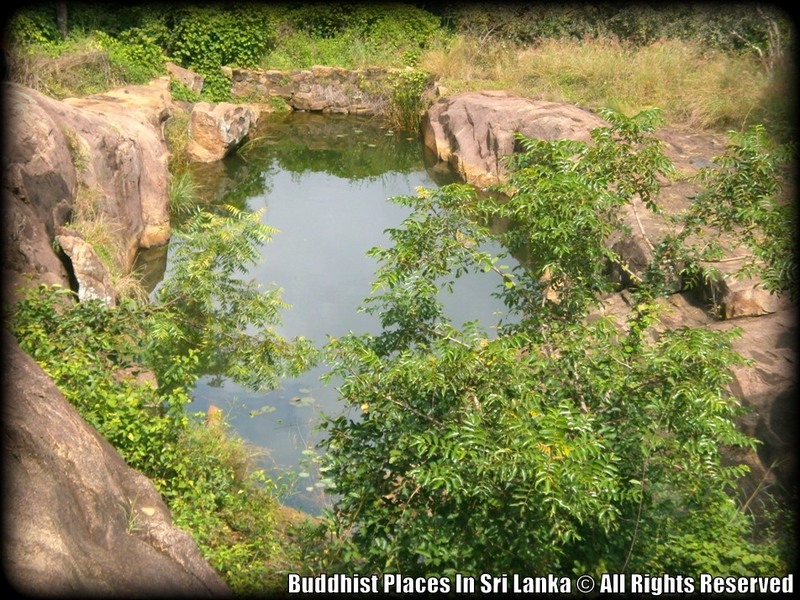 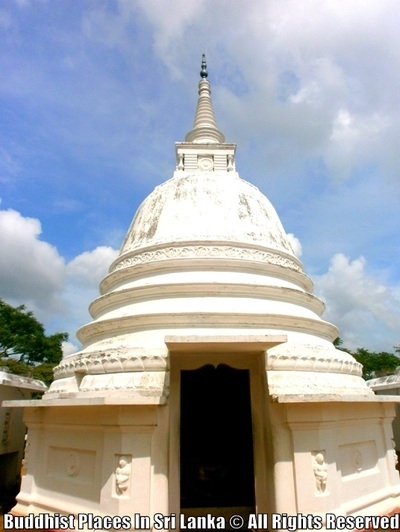 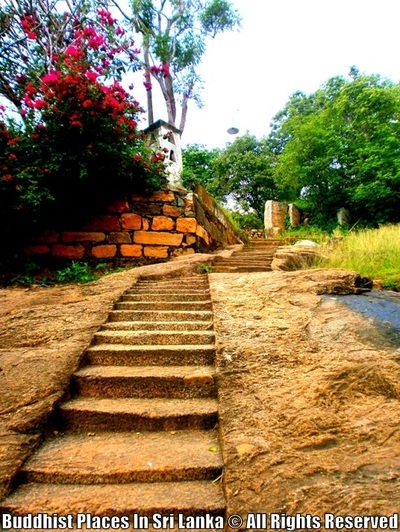 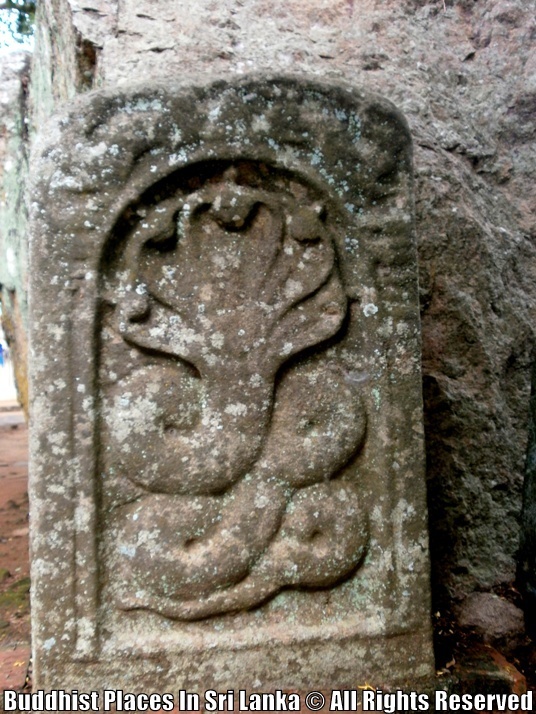 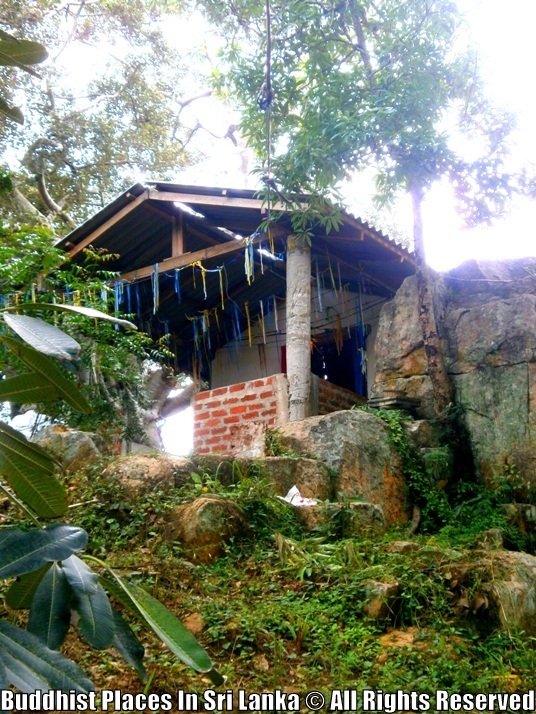 Reswehera Rajamaha Vihara is an ancient temple which was built by the king Devanampiya Tissa (307BC-267BC) situated in north western province in Sri Lanka. The hand of the Buddha faces the viewer sideways in what is known as the Ashisha Mudra (Blessing Pose).